EpiGentek is now offering thousands of 20 μg trial size antibodies. These antibodies are well-characterized and validated in multiple applications such as ELISA, WB, IHC, IF & more. By purchasing a smaller size, you can test out an antibody first to see if it's right for you. 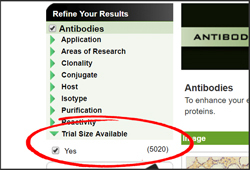 You can also refine your search results to find antibodies with trial size options. After you receive and test your antibody, we would love to hear back from you about your experience with the product. Your feedback will help other researchers make informed decisions about their purchases, plus allow us to further improve our products. *Trial sizes are only available on select antibodies. Not all trial sizes are available in 20 μgs. See product pages for individual volume size and price. Delivery times vary on trial size antibodies and may ship slower than full size products. If ordering from outside the USA, please contact your regional distributor to inquire about trial size availability. **Except as required by law, Amazon.com Gift Cards ("GCs") cannot be transferred for value or redeemed for cash. GCs may be used only for purchases of eligible goods on Amazon.com or certain of its affiliated websites. For complete terms and conditions, see www.amazon.com/gc-legal. GCs are issued by ACI Gift Cards, Inc., a Washington corporation. ©, ®, ™ Amazon.com Inc. and/or its affiliates, 2018. No expiration date or service fees.